Modern Man Thermogenic Topical Gel Review | Buy or a Scam? Modern Man Thermogenic Topical Gel is a pre-workout gel that produces heat to stimulate fat loss and accelerate warm-up and recovery time by increasing blood flow and circulation. Does Modern Man Thermogenic Gel contain the right ingredients in the required dosages to really have this effect? We take an in-depth look below to find out. Whilst it would be great to be able to reduce fat in a particular area by reducing sweating, unfortunately we cannot find anything in the way of evidence that increasing sweat production in an area of the body is going to reduce fat in that area. So as far as the claim of burning fat in a targeted area goes, we can’t help but have our doubts. From experience and from what research tells us, the body does burn fat, but essentially you cannot spot reduce fat. So if you’re trying to target fat around your middle, the only way that targeting’s going to be effective is if the only fat you’ve got anywhere on your body is around your middle. Modern Man Real Muscle is manufactured by Modern Man Nutrition LLC. They can be contacted either through Amazon or using the information provided on their official website. What Are The Side Effects Of Modern Man Thermogenic Topical Gel? There aren’t many side effects related to this topical gel. Tea tree oil could potentially cause skin irritation and swelling. The ingredients in Modern Man Thermogenic Topical Gel are going to behave differently when applied to the skin as opposed to when they’re taken by mouth. This product should not be eaten. There is the potential for skin reactions, and these can include skin problems, breathing problems, and allergic reactions. How Much Does Modern Man Thermogenic Topical Gel Cost? Modern Man Thermogenic Topical Gel is expensive for this kind of product. 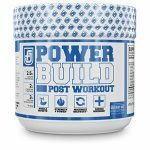 It costs $39.99 for a 237g tub. As the individual ingredient quantities aren’t provided it is hard to say how much impact each one will have, but either way, they are unlikely to do much more than moisturise the skin and perhaps soothe aching muscles slightly. Vitamin E (or Tocopherol Acetate) has been found to help with physical endurance and post-workout muscle breakdown. However, it is so far down the list of ingredients that realistically it is highly likely to be present in small doses in this product. We haven’t managed to find any conclusive proof that a bit of extra sweating results in weight loss. Some extra water could be lost through increased sweating, but that does not provide any permanent weight loss. 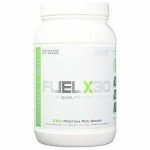 Also, the whole idea of targeting an area to burn fat from sounds great, but in reality, it’s too good to be true – otherwise this would likely be a very popular and well-known product! The first and therefore main ingredient listed is just Petroleum Jelly, which translates to Vaseline which would be a much cheaper alternative to this topical gel. It is likely that many of the other (numerous) ingredients are present in low amounts, so probably won’t do that much. Added to all this the fact that Modern Man does not offer a money-back guarantee, and we simply cannot approve this product. We do not recommend Modern Man Thermogenic Topical Gel to our readers. Modern Man Thermogenic Topical Gel is a gel that you rub onto your body before a workout to supposedly enhance your workout through increased circulation and sweat activation. 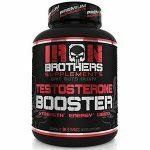 They say that it targets problem areas, increases oxygen uptake, and harnesses the benefits of thermogenesis to stimulate more fat loss. Warming up your muscles before a workout – which is what this topical gel is supposed to do – is generally a good idea; warm muscles work better and don’t stiffen up as much after use. However, as a weight loss gel, it just isn’t going to work. You cannot spot reduce fat, so however much you sweat from a particular area, it doesn’t mean that you will lose fat there. Prior to exercise, apply a generous amount to the desired portion of the body. Rub in thoroughly and wash hands immediately after application. There are some nice ingredients in there that will moisturise the skin, but we have no idea how much of any of them are in this gel so it’s hard to say how good they will be. Methyl salicylate is used to treat minor aches and pains of the muscles. It works by causing the skin to feel cool and then warm which distracts you from feeling the aches and pains deeper into your muscles. However, this ingredient is also pretty far down the ingredients list so is unlikely to contain much, but it could still help with your achy muscles a bit. Modern Man Thermogenic Topical Gel is manufactured by Modern Man Nutrition LLC. They can be contacted either through Amazon or using the information provided on their official website. What Does Modern Man Thermogenic Topical Gel Claim To Do? Modern Man Thermogenic Topical Gel claims to enhance your workout experience through increased circulation and sweat activation. 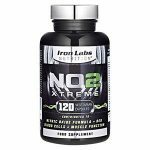 They say it defines muscles and activates fat loss, as well as accelerating warm-up and recovery time. Does Modern Man Thermogenic Topical Gel Work? Modern Man Thermogenic Topical Gel could help your muscles to loosen up a bit before a workout, and potentially help soothe aching muscles after a workout. 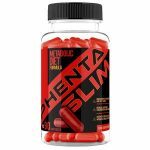 However, it is not going to help you lose weight and certainly not in targeted areas, as you cannot spot reduce fat, especially with a gel rubbed into your body. Any slight weight loss would be water weight and would only be temporary. Plus it is more likely that you would have lost water from working out rather than this product. What Are The Ingredients of Modern Man Thermogenic Topical Gel? The ingredients used in Modern Man Thermogenic Topical Gel are listed below. The individual ingredient quantities are not listed. Petrolatum: Just Petroleum Jelly, or Vaseline. Aloe Barbadensis Leaf (Aloe Vera Gel) Juice: Good for healing damaged skin. Cocos Nucifera (Coconut Oil): Taken orally, this may help burn fat, suppress appetite, and boost energy. As for applying it to the skin, it’s an excellent moisturiser. Paraffin: A white or colourless soft solid that is used as a lubricant and for other applications. Helianthus Annuus (Sunflower) Oil: Consists primarily of triglycerides of linoleic and oleic acids. It supplies more Vitamin E than any other vegetable oil. Camellia Sinensis (Green Tea) Extract: Research has established that topical application of green tea leaves or extracts have many benefits for skin, including anti-aging properties. The polyphenols in green tea possess potent antioxidant and skin-soothing properties, and show significant promise for improving the appearance of sun-damaged skin. Melaleuca Alternifolia (Tea Tree) Leaf Oil: Tea tree oil is derived from the leaves of the tea tree. The chemicals in tea tree oil may kill bacteria and fungus, and reduce allergic skin reactions. Glycyrrhiza Glabra (Licorice) Root Extract: According to The National Cancer Institute, Glycyrrhiza Glabra has been used as an anti-inflammatory and antioxidant, primarily because of licochalcone, a molecule contained in licorice root extract which helps control oil production, and helps calm and soothe acne-prone skin. Prunus Amygdalus Dulcis (Almond) Oil: Prunus Amygdalus Dulcis (Sweet Almond) Oil acts as a lubricant on the skin surface, which gives the skin a soft and smooth appearance. Tocopherol Acetate (Vitamin E): Helps with muscle strength, physical endurance, and post-workout muscle breakdown. Simmondsia Chinensis (Jojoba) Seed Oil: Widens blood vessels, a good source of vitamins and a moisturiser. Persea Gratissima (Avocado) Oil: Avocado Oil is rich in triglycerides of oleic acid and contains lesser amounts of palmitic, linoleic, and palmitoleic acids. Coffee Extract: One of the most potent forms of natural antioxidants comes from green, unroasted, cold-pressed coffee beans. With more than ten times the antioxidant power of green tea, green coffee’s high levels of polyphenols, chlorogenic acid, and ferulic acid actively fight free radicals. These antioxidants allow the skin to reduce free radical damage, heal scar tissue, and promote rapid cell regeneration. Cassia Oil: Cassia bark oil is derived from the Cinnamomum cassia plant of the Lauraceae family. It is frequently compared to cinnamon bark oil and cinnamon leaf oil, which are both extracted from the same plant species. Methyl Salicylate: Used to treat minor aches and pains of the muscles/joints. Menthol and methyl salicylate are known as counterirritants. They work by causing the skin to feel cool and then warm. These feelings on the skin distract you from feeling the aches/pains deeper into your muscles, joints, and tendons. Does Modern Man Thermogenic Topical Gel Have Any Side Effects? There aren’t many side effects related to this topical gel. Tea tree oil could cause skin irritation and swelling. The ingredients in this Topical Gel are going to behave differently when applied to the skin as opposed to when they’re taken by mouth. This product should not be eaten. Do not use if pregnant or nursing. Consult with your physician before prior to using this product. 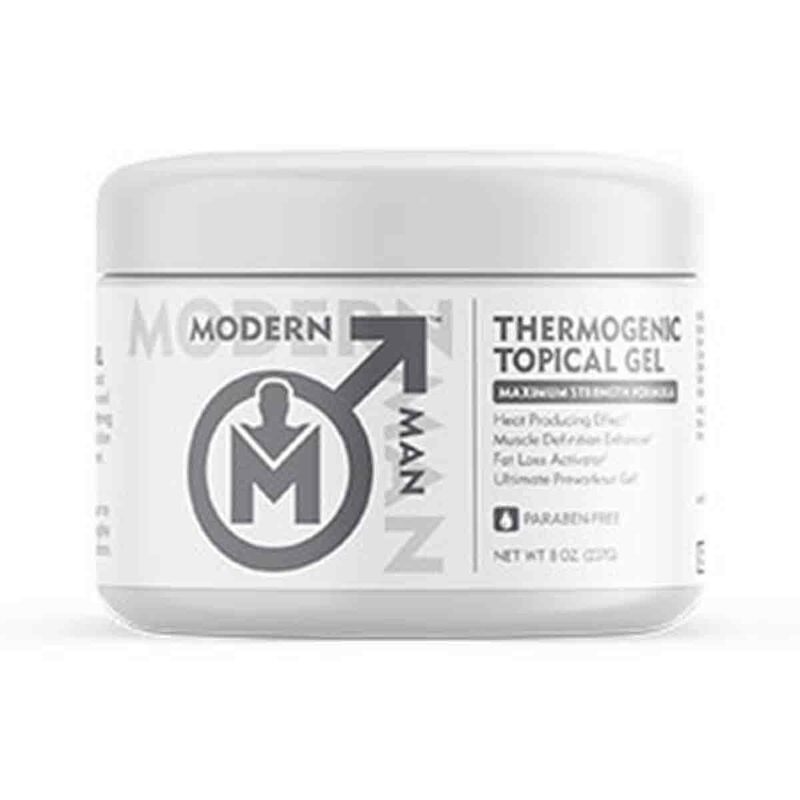 Are There Any Customer Reviews For Modern Man Thermogenic Topical Gel? There are no customer reviews for Modern Man Thermogenic Topical Gel on Amazon or anywhere else. Does Modern Man Thermogenic Topical Gel Offer a Money-Back Guarantee? Modern Man Nutrition does not offer a money-back guarantee. As their products are sold by Amazon, all purchases made there are covered by the Amazon returns policy. The Amazon returns policy lasts for 30 days starting from the receipt of the shipment. 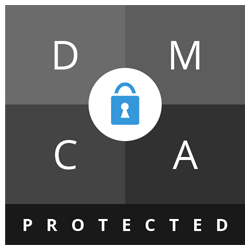 They are quite vague about what products do or do not qualify for return, so it is a good idea to contact them to check before sending any products back. Where Can I Buy Modern Man Thermogenic Topical Gel? 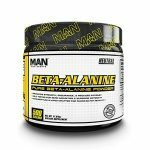 Modern Man supplements are advertised on their official website, but cannot be purchased directly from the website. Instead, customers are referred to Amazon, the only place that Modern Man products can be purchased from. A single tub of Modern Man Thermogenic Topical Gel costs $39.99 plus delivery charges. Customers with Amazon Prime can get free delivery. The Muscle Watchdog does not recommend Modern Man Thermogenic Topical Gel.